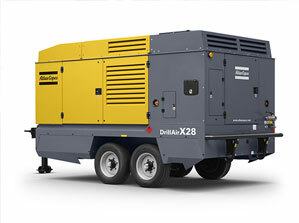 Atlas Copco is a world-leading provider of e.g. mining industry machinery and compressors, two business areas for which Rimaster supplies services and products. Our relationship with Atlas Copco goes back many years and started with manufacture of cable harnesses for the Swedish market.During the spring, Rimaster has begun delivering complex electrical cabinets for installation in Atlas Copco’s surface drill rig FlexiRoc D65. – These are tough environments that are very different from one another. That is why we have many different quality requirements that our suppliers need to fulfill, says Michael Sprengers, purchaser for Atlas Copco Portable Energy. “Portable” in this instance means that the compressors are not stationary but instead can be moved between various construction worksites. – We never know where our machines are going to be used, and on what roads they will be transported, so we build the machines to be robust and able to function for extended period under extreme conditions, such as extreme temperatures, powerful vibrations, and high moisture levels, says Sprengers. Rimaster has been a supplier to Atlas Copco for many years, and the collaboration has been developing the entire time. – Rimaster manufactures robust and high-quality products, and also in small volumes when necessary. Production planning works smoothly and we have good communication with respect to engineering. When new products are developed, it often happens that several wiring changes are made in rapid succession. Rimaster needs to respond to these changes and implement them as quickly as possible in order to ensure that Atlas Copco has the latestversion delivered on time, says Springers. – Rimaster does a good job. They are flexible when it comes to the type of construction changes that we often need to make. They are also flexible when we have orders, and can then deliver parts quickly, so that we in turn are able to fulfill our commitments on time. That’s something we appreciate. – This collaboration has recently seen an uptick in conjunction with Atlas Copco’s new project 8 series,” explains Sprengers – We are pleased with the collaboration, and hope that it will continue this way by continually assessing and improving the collaboration in all areas.